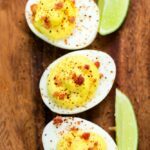 Deviled eggs with bacon is going to be your go to deviled eggs recipe for Easter and an easy appetizer. This classic deviled eggs recipe is full of flavor and has a little citrus kick added for good measure by the incorporation of Tajin! Deviled eggs is a favorite around here. If you’ve been around the blog long enough, you’ll notice a pattern. Latina Mom Meals loves flavor! And these simple Tajin deviled eggs with bacon are no different. It’s an extra level, as always! How do you make the perfect eggs for deviled eggs? For the past year there’s only one way I choose to make deviled eggs. 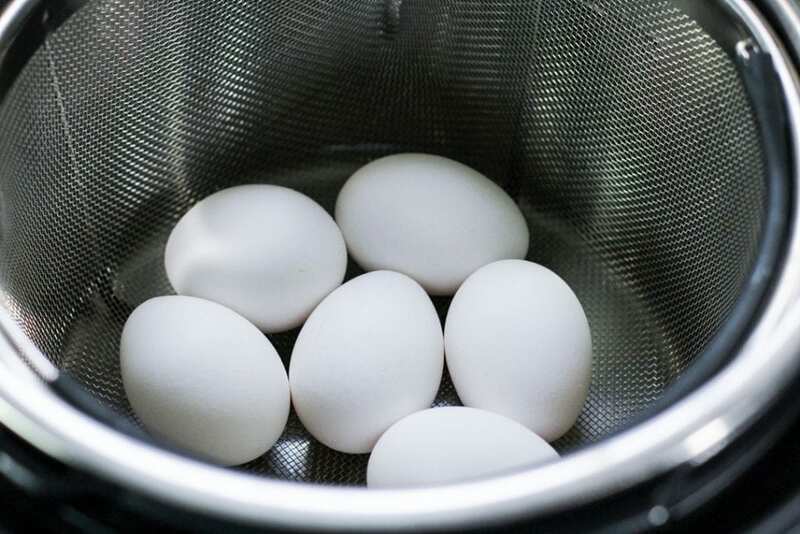 The fail-proof way to create the perfect boiled eggs is by using an Instant Pot. You can put as many as a dozen in at once and it’s literally timed on high pressure for 5 minutes. No babysitting, worrying if it’s reached the boiling point etc. 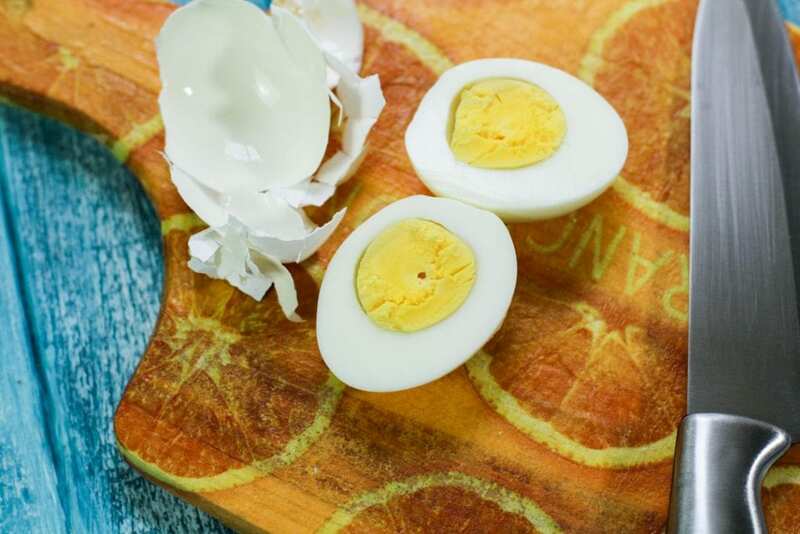 As soon as the 5 minutes are done, hit quick release, add your eggs to a bowl of ice water to stop the cooking and you have a perfect batch of boiled eggs for making a deviled eggs recipe. No green line! Cook the eggs in an Instant Pot for 5 minutes. If you rather use a stove top method, follow these recommendations from The Pioneer Woman. Add a splash of white vinegar to your water while cooking. This was a tip passed down to me from a beloved mentor Pat whom I miss dearly. Adding vinegar to the water for making deviled eggs helps make peeling eggs much easier. 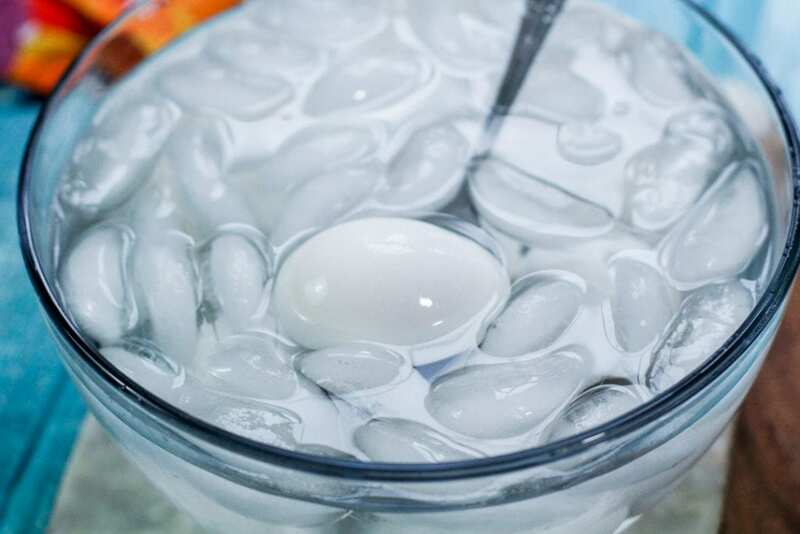 Place eggs in ice water for 2 minutes after cooking to stop the cooking process. This helps ensure there are no yucky green lines. Perfection at every bite! Make a few extra eggs. Seriously. You always have that one egg (or 2 or 4 if you’re me with kids running around). Use large eggs. This is the perfect size for deviled eggs! Wipe your knife between each cut with a damp paper towel or cloth. This keeps your cuts clean for a professional look. Use a pastry or Ziploc bag for filling the egg cavities with the yolk mixture. So much prettier than using the spoon method. Serve immediately. You can prep the eggs, just don’t fill the eggs until you’re ready to serve. Make it your own. Add minced veggies, a certain spice or herb, etc. Cooking is fun! Deviled eggs are like a blank canvas, have fun! I gave you simple tips above for making the perfect deviled eggs recipe. 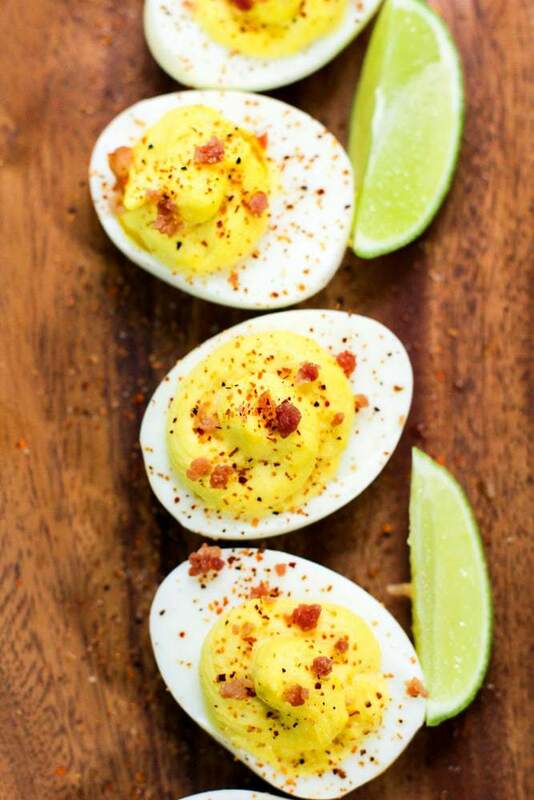 Now for making this special Tajin deviled eggs with bacon, we’re going to go above by adding in there favorites! 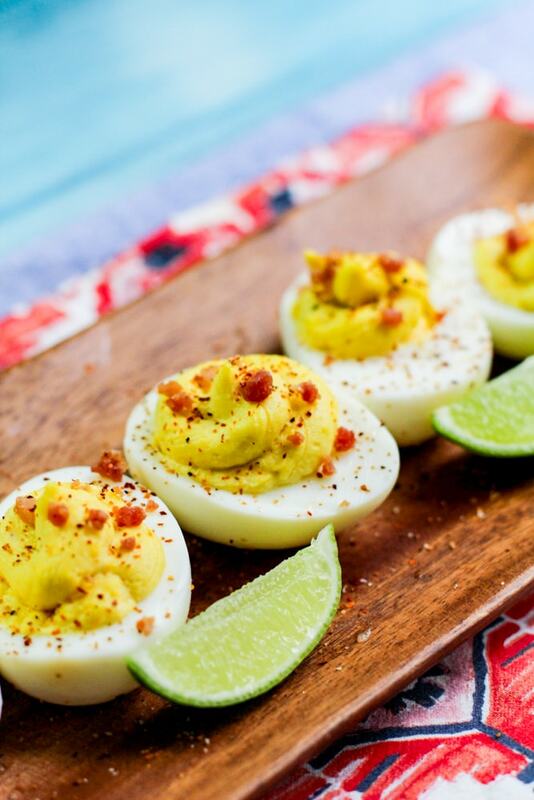 Creamy and with a gentle kick, this Latin inspired Tajin deviled eggs with bacon are going to be the talk of the party! place basket into Instant Pot. Close lid, set to sealing. Press manual high pressure for 5 minutes. After 5 minutes are over, set to quick release. Once eggs have cooled after 2 minutes, gently roll eggs and peel. Cut each egg in half, place the yolk into a small bowl and put the egg whites to the side. Into the small bowl with the yolk, add remaining ingredients except for the bacon and Tajin. Mix ingredients together. Take egg yolk mixture and place into a sandwich bag. Cut the corner, and gently fill the cavity of each egg white. Top each egg with crumbled bacon and Tajin and serve immediately. I didn’t know you could use the instant pot to cook eggs this way. I’m definitely going to try and see if I can get it right.